This dramatic species native to Central America and Mexico grows in wet lowland forest up to 1500m ands so we grow the species warm wet and shaded in our Warm Asia section. 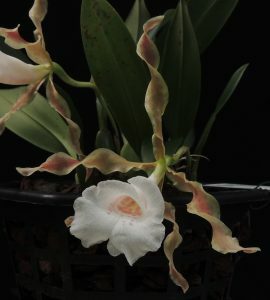 The flowers are large and scented but particularly interesting because of their corkscrew twisted petals and sepals which break the normal bilateral symmetry found in most orchid flowers. We are intrigued by the twisting and there is clearly a research project on the evolutionary advantages of this arrangement. This particular clone choses a clockwise twist and I wonder if this is always the case in the species. One would maybe expect opposite petals to twist in opposite direction (one clockwise and one anti-clockwise but this is not the case here.